What you must realize, what you must even come to praise, is the fact that there is no right way that is going to become apparent to you once and for all. The most blinding illumination that strikes and perhaps radically changes your life will be so attenuated and obscured by doubts and dailiness that you may one day come to suspect the truth of that moment at all. The calling that seemed so clear will be lost in echoes of questionings and indecision; the church seemed to save you will fester with egos, complacencies, banalities; the deepest love of your life will work itself like a thorn in your heart until all you can think of is plucking it out. Wisdom is accepting the truth of this. Courage is persisting with life in spite of it. And faith is finding yourself, in the deepest part of your soul, in the very heart of who you are, moved to praise it. – Christian Wiman, My Bright Abyss, 29. But this is a quibble. Good books leave you knowing more than you did to start with, and feeling less complacent about what you believed. David Free, in Saturday’s Australian reviewing John Kampfner’s The Rich. He’s onto something, when it comes to books about ideas. Complacency is the default for beliefs. For years, it feels I’ve been undergoing a long, continual shedding of complacency, to the point that almost every belief I hold feels either hard-won or tentative. Start doing that too much and the complacency of others seems criminal. But of course, there are probably worse things than complacency. It’s exposure to contrary viewpoints which sheds complacency. It’s critically examining the details, not just the brushstrokes. (You can spin anything to seem credible; you can squint at it, and pretend it’s not what it is.) It’s reading books you don’t agree with, not just to disagree with them, but to truly consider their arguments. But I’m riffing on Free’s point, which is actually about what “ideas books” can or should do – and that is to complicate our beliefs. You think rich people are all this, or all that? Examine the details, and your generalisations turn out to need more nuance. In the 1980s, Noah was a kids’ story. Here is a photo of me as Noah, age five or so. 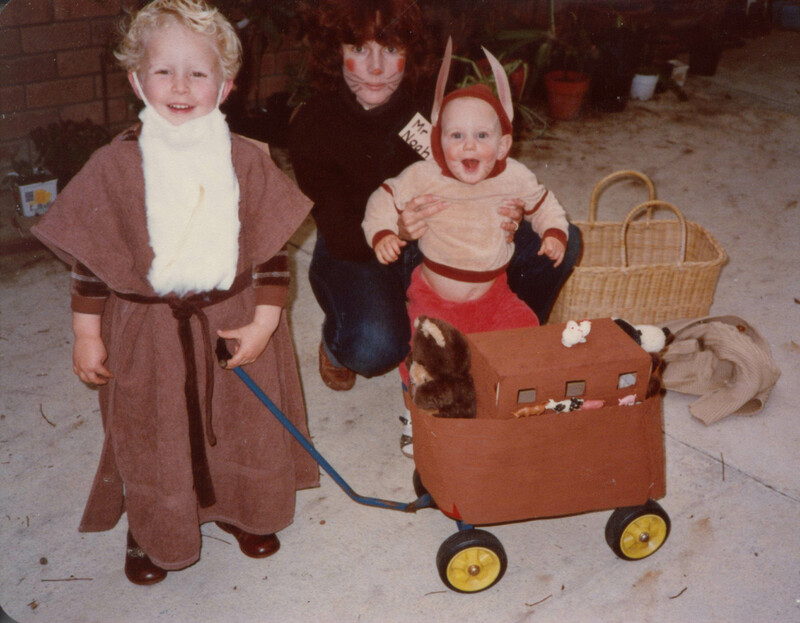 I loved having a cotton wool beard and my own little ark on a trolley, my brother one of the animals. The story is a Sunday School favourite for its craft possibilities, rather than its theological meaning. I don’t remember feeling any concern for the people who perished in the flood; they were evil – the story explained this. In the 2000s, I sat in the Life and Literature of Ancient Israel unit at university, and the Noah story became a touchpoint for source criticism and the claim that the editor of the Pentateuch wove together different traditions in this and other stories. I was confronted with the strange repetitions within the Noah story and the diverging details within it (how many animals? how many days?). I felt stupid for never noticing them before. Quixotically, I fought against source criticism, rallying together every scholarly objection or question mark over the theory. What was I trying to preserve? A particular view of the inspiration of the Bible. In the 2010s, the Noah story was at the centre of theological problems with the Old Testament. I read Eric Seibert’s Disturbing Divine Behavior and wondered why I’d never been disturbed by the genocide of almost all the human race in the flood. How could it be a kids’ story? How could we not question this depiction of God? Is it consistent with the God we know in Jesus Christ? And now, in 2014, I’ve just watched Darren Aronofsky’s Noah. It is a strange and fascinating film; its landscape and naive quest structure (and rock people) reminded me of The Never Ending Story more than anything, but it has a dark edge, and owes as much to the old-fashioned biblical epics. Here we are forced to question religious certainty, because Noah truly does some despicable things in his pursuit of what he believes to be his mission from the Creator. We see some of the realities of a global flood which kills thousands; the screams of the dying heard by Noah and his family within the ark are truly harrowing. (The scene felt to me something like what most evangelicals imagine the judgement of non-Christians at the return of Christ, while they are safe in their ‘ark’.) The story takes themes from elsewhere in the Bible – child sacrifice, barrenness, father and son arguments – and thickens the Noah story with them. It gives the Noah story the mythic sense which Genesis demands; this is something like our world, but it is certainly not our world as we know it. The Noah story is strange, and this new film captures some of that strangeness, closer to the origins of the Earth and of us.